for Alfred, Lord Tennyson’s Idylls of the King, 1867. There are numerous stories of varying description that purport to describe Merlin’s “end”. We should be fools, however, to think that the great Merlin came to any finality such as we mortals experience. It was nothing of the kind. If we are to understand where Merlin has gone, we must sift through the substantially divergent versions to find whatever useful information can be gleaned from them, eliminate all of the Christian moralizing and prejudicial animus that has diverted us from the original Pagan script, and combine what emerges into a truthful account of such facts as remain. As far afield as the thematic explanations of Merlin’s disappearance differ, they are consistent in one essential respect, namely, that in all of them, “Merlin retires from all society and withdraws into eternal silence.” (2) Some say that he abides in an amorphous state between worlds at his mysterious L’esplumoir Merlin, (3) others, that he lies buried in a cave, or tomb, or glass tower, or between walls of air, or that he studies the heavens in his observatory in the woods, or that he is cradled within the embrace of the fragrant hawthorn bush. of oure Lorde, haste you soone to come agein." "Sir," seide Merlin, "this is the laste tyme; and therfore, to God I you comaunde." and travailed till he com to Blase his maister . . . .
seth it is so that ye may not departe, cometh not ther." "Me behoveth for to go,"
The problem with so many of the elaborations of Merlin’s “end” is that they leave out crucial mythical and symbolic details, either purposely or as a result of ignorance, thereby missing the whole point of the story. Additionally, there is such an excess of – largely Christian – judgmental derision and projection that Merlin ends up looking either like a fool or a madman, or both, while the lovely Vivien, or Niniane, is portrayed as a vicious, conniving woman, at best, or a lascivious harlot, at worst. In many of the mediaeval romances, she is character-ized in the other extreme – as the innocent nubile virgin who defends her virginity against a driveling old man who perpetually chases after her and whom she comes to despise utterly, and who takes her revenge by enchanting the Enchanter. In this role, there is sometimes “a strain of duplicity . . . perceptible in her character, as in the nature of a sorceress who entices heroes to their own undoing”, (8) and she is seen as having deliberately and purposefully caused Merlin irreparable harm, entrapping him for all of eternity in her snares. Because the mythic themes of this Breton version are very old, we would be advised to pay attention to this rich telling which makes it very clear from beginning to end that “Merlin was not imprisoned by magic art, but achieved bliss through his love for the fairy forest nymph.” (13) It also allows us to see what is lost in so many of the other variants – that Merlin is no ordinary man; that despite his magisterial robes, and his rarified position in Arthur’s Court, the forest is his natural habitat – the place where he is truly at home. And it is the place where he finds his final rest from the cares of the world, in the ancient Forest of Broceliande, that sacred forest which, according to Villemarqué, the priestesses of Druidism inhabited in Gaul. (14) And this is where he belongs, for whatever else Merlin is, he is a Druid first and foremost. This so-called “mythical” forest, consisting mostly of broad-leafed oaks, (15) was, in fact, visited by the Norman poet Wace in the 12th century who “even in his day knew [that Broceliande] was the haunt of fays” (16) and was sorely disappointed not to encounter any there, and by Villemarqué in the 19th, who remarked on its evi-dently still resonating Druidic presence. (17) That most ancient correspondence between the Druids and trees, especially with that of the oak, – which stems largely from the literal meaning of the word Druid, from dru-wid, or ‘oak-wise’ – is firmly embedded in Merlin’s mythology. It is so much so, that when the already widely-known folktale of Tom Thumbe, which is set at the Court of King Arthur, appeared in print for the first time in 1621, it duly noted that Tom’s mother went to pay her respects and to seek the advice of the old Druid by presenting herself at the “Caue of old Merlin, which was the hollow trunke of a blasted Oke, all ouer growne with withered mosse, . . . [where she finds him] mumbling spels of incantation, making Characters in sand, with an Ebone staff.” (18) Nearly two hundred and fifty years later, when Gusave Doré created his illustrations for Alfred, Lord Tennyson’s Idylls of the King, his 1867 engraving of Merlin and Vivien showed a dewy-eyed old magician leaning against an enormous old oak with his belovèd fairy mistress swooning in his lap. (19) As it happens, she, too, has extra-ordinary connections with the oak woods. We have been bequeathed an unforgettably moving portrait of her by the poet Alan Seeger in his 1916 Vivien. Clothed her as sunshine clothes the summer world. Nibbling their foods and fawning at her feet. Beside a fountain in Broceliande. Would follow, tranced, and seek . . . and find her not . . . Although she has caught the eye of many a dreamy poet, there is a paucity of substantive information about this alluring beauty. This may be explained by the fact that “in studying Niniane, we are seeking to discover the fundamental traits of a fay who has practically no independent existence in romantic material outside of her relations to Merlin.” (24) While such a narrowly focused biography may be unusual in the mythological world, there is a little-known, perfectly rational mythical explanation for Niniane’s singular attachment to Merlin. It seems that at the time of her birth, she was pledged to Merlin by her father’s godmother, Diana, that centuries-old goddess-queen of the oak cult whom Frazer immortalized in The Golden Bough. Niniane is elusive because she is ‘his’. And in return, Merlin is ‘hers’ to do with what she wishes. That is their mutual Destiny. There is no getting around it. compel her to consent to his. "A scholar returning to his master," was the reply. "Your master? And what may he teach you, young sir?" and can peer far into the future--aye, to the extreme of human days." the desire of hidden things which she had inherited from her fairy mother. for your instruction my most tender friendship." Then he made a tryst with Vivien to meet her in a year on the Vigil of St John. of love for her that all his wisdom, deep as it was, could not control. in his great passion for her. loved you they would slay me." her the marvellous circumstances of his birth. was flowering at the edge of the forest. Again he wore the scholar's garments. he whom she loved was in reality well stricken in years, and she was sorrowful. But she did not despair. secret more that I desire to learn." "Wherefore do you sigh?" she asked innocently. prisoner for all time. Neither have I the power to deny you what you ask of me." all my thoughts and desires toward you?" to ask what you will." her in the chains of love that nothing in the world could part him from her. Evening was shrouding the forest in soft shadows when Merlin sank to rest. in the Joyous Garden with Vivien by his side. "You are mine for ever," she murmured. "You can never leave me now." ments she induces him to show her how to keep a man asleep at her pleasure. Niniane can destroy. She dwells with him, but goes in and out at her own will. continued. And he took his leave of Arthur and the world of his fame. magic forest, she received him more winningly and passionately than ever. able. Whereupon she sat down, and again took Merlin’s head in her lap. coming invisible, the best possible place to find ferns would be in a forest such as that which serves as the backdrop for our story. As is the case with all members of the family of the Rose, there is the thorny side of the hawthorn to consider. Much in use as a hedge-barrier, its name is derived from the rather ominous combination of the words, hag, meaning both ‘hedge’ and ‘witch’, plus thorn. (63) It is, “in general, an unlucky tree and the name under which it appears in the Irish Brehon Laws, sceith, is apparently connected with the Indo-Germanic root sceath or sceth, meaning ‘harm’; from which we derive the English ‘scathe’,” (64) whose archaic use suggests ‘to injure or hurt’, ‘to blast’, ‘wither’, ‘sear’, or ‘denounce fiercely’. (65) This brings us squarely into Druidic territory, where scathing humor against one’s opponent can actually scar. Clearly, the Celts had an entirely other view of the hawthorn as is witnessed in the vast evidence of the full-blown sexual excesses of the rites of May 1st on the feast of Beltaine. One authority on the subject of folk superstition does advise, how-ever, that because “the hawthorn is . . . associated with fairies, . . . it is dangerous to sit under it on those special days when these intermediate spirits are most powerful, such as May Day, Midsummer Eve, or Hallowe’en. Whoever does so runs the risk of being enchanted or carried away by them.” (71) And so, with full knowledge, does Merlin lie with his fairy-love, Niniane, under the heady fully flowering boughs of the hawthorn. One can only guess that this must have been in the month of May, for it could not have been at any other time. This is the “branch of silver with white blossoms,” (73) which lulls to sleep by its “wonderfully sweet mysterious music”; (74) the magnificent, extravagantly blossoming Silver Bough, whose sudden appearance in story is always a clear sign that we are either in, or are about to cross, the threshold of the world of faerie, where it is always and forever springtime. In The Fairy-Faith in Celtic Countries, Evans-Wentz presents adventure after Irish adventure in which the hero who is destined “to enter the Otherworld before the appointed hour marked by death,” (75) is given the gift of a “silver branch of the sacred apple-tree bearing blossoms, or fruit,” by the Celtic fairy queen. (76) Sweet fairy music seems to emanate from the fully-flowering blossoms themselves, lulling its hearers to sleep, (77) or sending them into a swoon to prepare them for what they are about to experience in the Otherworld. The initiate emerges with a knowledge that can be found nowhere else. has experienced the fairy control there is no true release . . . [for] she . . . In the Celtic world, the turning of the sun divides the year into a never-ending sequence of new beginnings. At each successive station of the sun, the thin veil that separates the worlds is opened for a brief moment. At such liminal times, when things are “neither this nor that,” (81) it is as if a Druidic mist has enveloped the world. All boundaries vanish to create a mystical, mysterious atmosphere in which all the rules are suspended as one is subsumed into sacred time and sacred space. (82) What better time than Beltaine, at the moment of blossoming and fragrance and celebration of all that is alive with the fullness of life, to withdraw from the secular world into another of such bliss? What has been said of Arthur of Britain – that he is the penultimate King of the May – can be said, too, of his distinguished Druid. In the words of the early 13th century bard Wolfram von Eschenbach, “What fragrance, they say, is in the air around him!” (83) And, like his King, who soon thereafter floated into the land of mists that some call Avalon under the care of another of Merlin’s students of magic, the ‘Great Fairy Woman’, Morgan le Fay, Merlin abides in an amorphous state between worlds. He is suspended in time and space: neither here nor there, this nor that, not-dead. (84) He lives in the boundaries between worlds, invisible to all but his adored fairy mistress, Niniane. 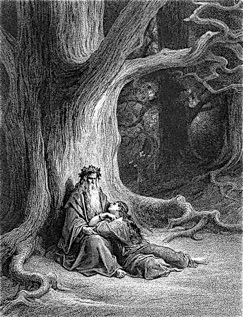 FRONTISPIECE ILLUSTRATION: Gusave Doré’s engraving of Merlin and Vivien showing the dewy-eyed old magician leaning against an enormous old oak with his belovèd fairy mistress swooning in his lap, which appeared in Alfred, Lord Tennyson’s Idylls of the King in 1867. From: Illustrations for “Idylls of the King”. (New York: Dover Publications, 1995), Plate X, p. 21. 1. Le Roi Artus, Vol. II, Continuation, as quoted in Norma Lorre Goodrich, Merlin. (New York: Harper & Row, 1988), p. 211. 2. Emma Jung and Marie-Louise von Franz, The Grail Legend. Andrea Dykes, Translator. (New York: G. P. Putnam’s Sons for the C. G. Jung Foundation for Analytical Psychology, 1972), p. 364. 3. See: Pierre de Gentil, “The Work of Robert de Boron and the Didot Perceval”, in Arthurian Literature in the Middle Ages: A Collaborative History. Roger Sherman Loomis, Editor. (Oxford: Oxford University, 1959), p. 259. For an exploration of Merlin’s esplumoir, see: Tracy Boyd, “The Birds in Arthur’s Court”, a work in progress to be published at <www.sacredthreads.net>. 4. Emma Jung and Marie-Louise von Franz, The Grail Legend, op. cit., p. 390, quot. Heinrich Zimmer, “Merlin”, in Corona, IX, 2, 1939. 6. Prose Merlin: Introduction. Edited by John Conlee. Originally Published in Prose Merlin (Kalamazoo, Michigan: Medieval Institute Publications, 1998. Available online at: <http://www.lib.rochester.edu/camelot/teams/pmint.htm>. 7. Prose Merlin. Edited by John Conlee. TEAMS Middle English Texts Series, 1988. Originally published as Prose Merlin. John Conlee, Editor. Kalamazoo, Michigan: Medieval Institute Publications, 1988. Online at: <http://www.lib.rochester.edu/camelot/teams/imprfr.htm> under Chapter 27, lines 16-24 . . . 38-47. 8. Lucy Allen Paton, Studies in the Fairy Mythology of Arthurian Romance. (NY: Burt Franklin, 1970 reprint of her original 1903 Radcliffe Thesis), p. 216. 9. Emma Jung and Marie-Louise von Franz, The Grail Legend, op. cit., pp. 394-95. 10. For more on Villemarqué, see: <Théodore Claude Henri, vicomte Hersart de la Villemarqué - Wikipedia, the free encyclopedia> and <http://en.wikipedia.org/wiki/Goursez_Vreizh>. 11. La Villemarqué, Théodore Claude Henri, in The Encyclopaedia Britannica. Eleventh Edition. (Cambridge, England: Cambridge University Press, 1911), Vol. XVI, p. 294; and <Théodore Claude Henri, vicomte Hersart de la Villemarqué - Wikipedia, the free encyclopedia>. 12. Alfred Nutt, The Fairy Mythology of Shakespeare, in A Fairy Tale Reader: A Collection of Story, Lore and Vision. John & Caitlin Matthews, Eds. (London: Aquarian/Thorsens, 1993, Excerpted from Alfred Nutt, The Fairy Mythology of Shakespeare. (London: David Nutt, 1900), pp. 177-78 passim. 13. Lewis Spence, Legends and Romances of Brittany. (Mineola, NY: Dover Publications, Inc., 1997 republication of the work originally published by Frederick A. Stokes Company, New York, n.d.), p. 65. 14. Lady Charlotte Guest, “Note on the Forest of Breceliande and the Fountain of Baranton”, in The Mabinogion. Lady Charlotte Guest, Translator. 1877, p. 75, quoting the Vicomte Théodore de la Villemarqué, “Visite ou Tombeau de Merlin” in Revue de Paris. Tome 41. 7 Mai, 1837, pp. 47-58, in the original French: “ces forêts sacrées qu’habitaient les prêtresses du druidisme dans les Gaules”, at: <http://www.sacred-texts.com/neu/celt/mab/mab08.htm>. 16. Lucy Allen Paton, Studies in the Fairy Mythology of Arthurian Romance, op. cit., p. 95. 17. Lady Charlotte Guest,“Note on the Forest of Breceliande and the Fountain of Baranton”, in The Mabinogion, op. cit., p. 75, quoting the Vicomte Théodore de la Villemarqué, “Visite ou Tombeau de Merlin” in Revue de Paris. Tome 41. 7 Mai, 1837, pp. 47-58, at: <http://www.sacred-texts.com/neu/celt/mab/mab08.htm>. 18. Richard Johnson, The History of Tom Thumbe, in Iona and Peter Opie, The Classic Fairy Tales. (Oxford: Oxford University Press, 1974, Reissued 1992), p. 33, in which the entire tale published by Richard Johnson as The History of Tom Thumbe, the Little, for his small stature surnamed, King Arthur’s Dwarfe: Whose Life and aduentures containe many strange and wonderfull accidents, published for the delight of merry Time-spenders, of which only one copy has survived, is reproduced on pp. 33-46. See also: Tracy Boyd. “Titania, the Queen of Faerie, and the Druid Tom Thumbe”, at <www.sacredthreads.net>. 19. Gusave Doré, Doré’s Illustrations for “Idylls of the King”. (New York: Dover Publications, 1995), “Vivien”, Plate X, p. 21. This appears as the Frontispiece for the present article. 20. Celtic scholar John Rhys, who thinks her names are a misreading of Rhiannon, remarks in his Studies in the Arthurian Legend, that in the preface to the Huth Merlin alone, “preference is given to Ninienne over Nivienne, and forms such as Niniane, Niniene, Nimenne, Nimainne, Jumenne, are mentioned; also Viviane and Vivienne, the worst and most popular in print.” (John Rhys, Studies in the Arthurian Legend. (Oxford: Clarendon Press, 1891), p. 284, Note 1. 21. Lucy Allen Paton, Studies in the Fairy Mythology of Arthurian Romance, op. cit., p. 240. 22. D. P. Simpson, Cassell’s Latin Dictionary. (London: Cassell & Company Limited/New York: Macmillan Publishing Co., Inc., First Macmillan Edition, 1977), “vivus”, p. 647. 23. Alan Seeger, Vivien, 1916, in Poems by Alan Seeger. William Archer, Introduction. (New York: Charles Scribner’s Sons, MCMXVII), p. 86. Seeger is most remembered for his stirring World War I poem I Have a Rendezvous With Death . . . , which was one of his last poems. (Ibid., p. 144.) He was killed in the Great War. His Vivien is also available on line courtesy of The Camelot Project at the University of Rochester at <http://www.lib.rochester.edu/camelot/vivmenu.htm>. 24. Lucy Allen Paton, Studies in the Fairy Mythology of Arthurian Romance, op. cit., pp. 204-05. 25. Lady Charlotte Guest, “Note on the Forest of Breceliande and the Fountain of Baranton”, in The Mabinogion, op. cit., p. 74, available online at: <http://www.sacred-texts.com/neu/celt/mab/mab08.htm>. 26. Sir James G. Frazer, The Golden Bough: A Study in Magic and Religion. Part I, The Magic Art and the Evolution of Kings. Two Volumes. Third Edition. (London: Macmillan and Co., Limited, 1922), Vol. II., p. 381; and pp. 376-387. 28. See: Lucy Allen Paton, Studies in the Fairy Mythology of Arthurian Romance, op. cit., p. 239. 29. See: Lucy Allen Paton, Excursus IV: “The Diana Myth and Fairy Tradition”, in Studies in the Fairy Mythology of Arthurian Romance, op. cit., p. 275-76, citing: Cicero, De Natura Deorum, II, 68: Catullus, Carm. xxxiv; Horace, Carm. Saec, v. 15; above, p. 193, note i.; and Paton, passim, pp. 275-79. For more on goddesses of childbirth and the pronunciations of the Fate of the child, see: Tracy Boyd, “The Keepers of the Flame: Vesta and Her Brides”at <www.sacredthreads.net>. 30. Lucy Allen Paton, Studies in the Fairy Mythology of Arthurian Romance, op. cit., p. 276. 31. Roger Sherman Loomis, “A Survey of Scholarship on the Fairy Mythology of Arthurian Romance Since 1903”: “Niniane of Viviane”, in the Supplement to Lucy Allen Paton, Studies in the Fairy Mythology of Arthurian Romance, op, cit., p. 298. 32. Lucy Allen Paton, Excursus IV: “The Diana Myth and Fairy Tradition”, in Studies in the Fairy Mythology of Arthurian Romance, op. cit. p. 279. 34. Heinrich Zimmer, “Four Romances from the Cycle of King Arthur”: IV. “Merlin”, in The King and the Corpse: Tales of the Soul’s Conquest of Evil. Joseph Campbell, Editor. (NY: Pantheon Books, The Bollingen Series XI, 1948, p. 197. 35. See: Lucy Allen Paton, Studies in the Fairy Mythology of Arthurian Romance, op. cit., p. 205. 36. Lewis Spence, Legends and Romances of Brittany. (Mineola, NY: Dover Publications, Inc., 1997 Republication of the work originally published by Frederick A. Stokes Company, New York, No Date), p. 69, referencing Geoffrey of Monmouth's book and the Morte d’Arthur. 37. Ibid., p. 65; the following being a translation of Villemarqué’s 1861 Myrdhinn, ou l’Enchanteur Merlin. 38. Lewis Spence, Legends and Romances of Brittany, op. cit., pp. 64-69. Spence translating/quoting from Villemarqué’s 1861 Myrdhinn, ou l’Enchanteur Merlin. 39. Summary by Lucy Allen Paton, Studies in the Fairy Mythology of Arthurian Romance, op. cit., in “Niniane and Merlin”, pp. 205-206, citing her sources in p. 205, Note 1: Vulgate Merlin, pp. 222-226, 299, 402, 432, 452, 483, 484, 493, 494; English Merlin, pp. 307-312, 378, 565, 607, 634, 679-681, 692-694; Merlin (1528), I, cxlv, cxlvi ; II, cxxvi, cxxvii; Paris, R. T. R., II, 174-181, 334; Livre d'Artus, P., §§ 17, 30, 67, 85, 87, 89 ff., 101, 130, 136. 40. See Paton’s detailed delineation of the differences between the versions in Lucy Allen Paton, Studies in the Fairy Mythology of Arthurian Romance, op. cit., in “Niniane and Merlin”, pp. 205-227. 41. Heinrich Zimmer, “Four Romances from the Cycle of King Arthur”: IV. “Merlin”, in The King and the Corpse: Tales of the Soul’s Conquest of Evil. Joseph Campbell, Editor. (NY: Pantheon Books, The Bollingen Series XI, 1948, pp. 195-96, translating/quoting Roman de Merlin, 277-280, 526, 554-557, Sommer’s ed., pp. 223-226, 45-452, 482-484. 42. J. C. Cooper, An Illustrated Encyclopedia of Traditional Symbols. (London: Thames and Hudson, 1978), “Numbers”, p. 118. 43. See: Alwyn Rees and Brinley Rees, Celtic Heritage: Ancient Tradition in Ireland and Wales. (London: Thames and Hudson, 1961), passim, pp. 192-96. 44. About the ninth wave, see: Tracy Boyd, “The Mythic Ground of the Longing for Wisdom and Love in William Butler Yeats’s The Song of Wondering Aengus” under the heading “Shape Shifting” at <www.sacredthreads.net>; and Alwyn Rees and Brinley Rees, Celtic Heritage: Ancient Tradition in Ireland and Wales, op. cit., pp. 96-97. 45. See: Ibid., pp. 194-95. 47. J. C. Cooper, An Illustrated Encyclopedia of Traditional Symbols, op. cit., “Numbers”, p. 118. 48. For a discussion of the power of these numbers carried over into things like the re-drawing of boundaries and the precautions taken in the kindling, or configuration of the laying of the new fires at the ritual celebrations of the New Year, such as those of Beltaine, see: Tracy Boyd, “The Daunce of Nine-Men’s Morris and The Boundaries Between Worlds”, under the heading: “The Boundaries Between Worlds” and “Fire Rites” at <www.sacredthreads.net>. For a very far-ranging and fascinating study of “nines”, see: Stuart Mc Hardy, The Quest for the Nine Maidens. (Trowbridge, Scotland: Cromwell Press, 2003. 49. For a detailed discussion of the confusion of these eves, see: Tracy Boyd, “Finding the Light at Our Lady of Chartres”, under the heading: “Timing is Everything” at <www.sacredthreads.net>. 50. Robert Graves, The White Goddess: A Historical Grammar of Poetic Myth. (New York: Farrar, Straus and Giroux, 1974; 7th Printing of Amended and Enlarged Edition of 1966), p. 177. 51. For the perennial battle of Winter and Summer, See: Tracy Boyd: “The Tarot Fool’s Hand”, under the heading: “The Fool’s Dance” at <www.sacredthreads.net>. 52. Lewis Spence, The Magic Arts in Celtic Britain. (Mineola, NY: Dover Publications, Inc., 1999 unabridged republication of 1945 edition), p. 63, quot. Sir Walter Scott, The Minstrelsy of the Scottish Border, II, p. 278. 55. Heinrich Zimmer, “Four Romances from the Cycle of King Arthur”: IV. “Merlin”, in The King and the Corpse: Tales of the Soul’s Conquest of Evil, op. cit., p. 197. 57. Robert Graves, The White Goddess: A Historical Grammar of Poetic Myth, op. cit., p. 176. 58. Katharine Briggs, An Encyclopedia of Fairies: Hobgoblins, Brownies, Bogies, and Other Supernatural Creatures. (New York: Pantheon Books, 1976), “Fairy trees”, p. 159. 59. J. C. Cooper, An Illustrated Encyclopaedia of Traditional Symbols, op. cit., “Hawthorn”, p. 80. 62. Roy Vickery, A Dictionary of Plant-Lore. (Oxford: Oxford University Press, 1997), “Hawthorn”, p. 168, quot. J. Goody, The Culture of Flowers. (Cambridge: Cambridge University Press, 1993), p. 256. 63. Webster’s New World Dictionary of the American Language. College Edition. (Cleveland and New York: The World Publishing Co., 1959), “hawthorn”, p. 665. 64. Robert Graves, The White Goddess: A Historical Grammar of Poetic Myth, op. cit., p. 174. 65. Webster’s New World Dictionary of the American Language, op. cit., “scathe”, p. 1302. 66. Robert Graves, The White Goddess: A Historical Grammar of Poetic Myth, op. cit., p. 175. 67. Robert Graves neatly summarizes the events in a few paragraphs in his The White Goddess: A Historical Grammar of Poetic Myth, op. cit., pp. 174-75. For a very detailed article about the extensive Roman rites, see: Tracy Boyd, “The Keepers of the Flame: Vesta and Her Brides”at <www.sacredthreads.net>. 68. Robert Graves, The White Goddess: A Historical Grammar of Poetic Myth, op. cit., p. 174. 71. E. and M. A. Radford, with Christina Hole, Editor/Revisions. The Encyclopedia of Superstitions. (New York: Metro Books, 2002), “Hawthorn”, p. 183. 72. Lucy Allen Paton, Studies in the Fairy Mythology of Arthurian Romance op. cit., p. 210. 75. Walter Yeeling Evans-Wentz, The Fairy-Faith in Celtic Countries. (New Hyde Park, NY: University Books, Inc., First Printing, June 1966, First published in this form by Oxford University, 1911), p. 336, and pp. 336-351 passim. 77. Ibid. See especially, “The Voyage of Bran, Son Of Febal”, pp. 338-40, and “Cormac’s Adventure in the Land of Promise”, pp. 340-43. 78. Lucy Allen Paton, Studies in the Fairy Mythology of Arthurian Romance op. cit., p. 4, Note 2: For a popular discussion of the relation between the Celtic fay and the fairy of Shakespeare see Nutt, The Fairy Mythology of Shakespeare, London, 1900. We do not necessarily agree with Ms. Paton on this point about Titania. For an in-depth discussion of Titania, see: Tracy Boyd, “Titania, The Queen of Faerie, and the Druid Tom Thumbe” at <www.sacredthreadsnet>. 79. Lucy Allen Paton, Studies in the Fairy Mythology of Arthurian Romance op. cit., pp. 4-5, p. 5, Note 1 Cf. Philipot, Rom., XXV (1896), 279. 80. Lucy Allen Paton, Studies in the Fairy Mythology of Arthurian Romance, op. cit., pp. 4-6, p. 6, Note 1. On the nature of the fay see Nutt, Holy Grail, p. 232; id., The Fairv Mythology of Shakespeare, pp. 17, 18; Schofield, Studies and Notes, V, 237; Lays of Graelent, etc., pp. 131, 132; Brown, Studies and Notes, VIII, 19-22. 81. Alwyn Rees and Brinley Rees, Celtic Heritage: Ancient Tradition in Ireland and Wales, op. cit., p. 345. 82. See: Tracy Boyd, “The Daunce of Nine-Men’s Morris and The Boundaries Between Worlds”, under the heading: “The Boundaries Between Worlds” at <www.sacredthreads.net>. 83. Wolfram von Eschenbach, Parzival: A Romance of the Middle Ages. Helen M. Mustard and Charles E. Passage, Translation and Introduction. (New York: Vintage Books, A Division of Random House, 1961), Book VI, 281, p. 153. 84. For a thoroughly enjoyable discussion of these states of “betwixts-and-betweens”, see: Alwyn Rees and Brinley Rees, Celtic Heritage: Ancient Tradition in Ireland and Wales, op. cit., pp. 345-46.
for the casual reader who does not mind not always knowing which story came from where. -Carolyne Larrington, King Arthur’s Enchantresses: Morgan and Her Sisters in Arthurian Tradition. London/New York: I.B. Tauris & Co., Ltd., 2006. A brilliant analysis of the facts, impeccably researched and presented by a scholar of Mediaeval English. -Caitlin and John Matthews, Ladies of the Lake. London: Thorsens, an imprint of HarperCollinsPublishers & The Aquarian Press, 1992. Jumps all over the place with much interesting information and conjecture by two long-time Celtic scholars. -“Merlin and Vivien”, in The Poetical Works of Alfred, Lord Tennyson, Poet Laureate. Eugene Parsons, Biographical and Critical Introduction. New York: Thomas Y. Crowell & Co. Publishers, 1900), pp. 268-286. An extremely well known and very venomous view of Vivien and Merlin. -The Romance of Merlin: An Anthology. Peter Goodrich, Editor. (New York & London: Garland Publishing, Inc., 1990. -Jessie L. Weston, “Merlin”, in The Encyclopaedia Britannica. Eleventh Edition. Twenty-Nine Volumes with Index. Cambridge, England: At the University Press, 1911), Vol. XVIII, pp. 170-71.